I’m back at the farm after a week in the mountains with my family while the kids did some swimming lessons, and I enjoyed the convenience of living in town. Country Boy stayed to keep the farm turning over while we were gone. When we arrived home on Saturday, there was a bowl of tomatoes sitting on the bench, heralding the start of tomato season. On Sunday morning more tomatoes were ripe and ready for the picking. After five summers here on the farm, I should be used to the amount of produce we grow, but it still takes me by surprise every time. Each year I still feel overwhelmed, and wonder if I should quit my job and stay home to pickle and preserve all day long. Of course I’m not serious, but I am on the hunt for new ways to use all the tomatoes. 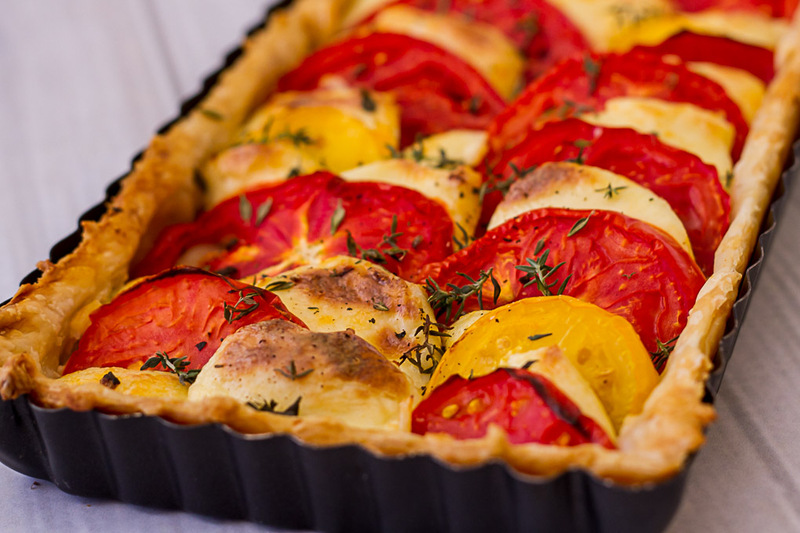 I made this tomato and mozzarella tart to use up some of the tomatoes, but to be honest, it hardly made a dent in the supply. It was, however, delicious. 4-5 tasty ripe tomatoes - fleshy tomatoes work best. 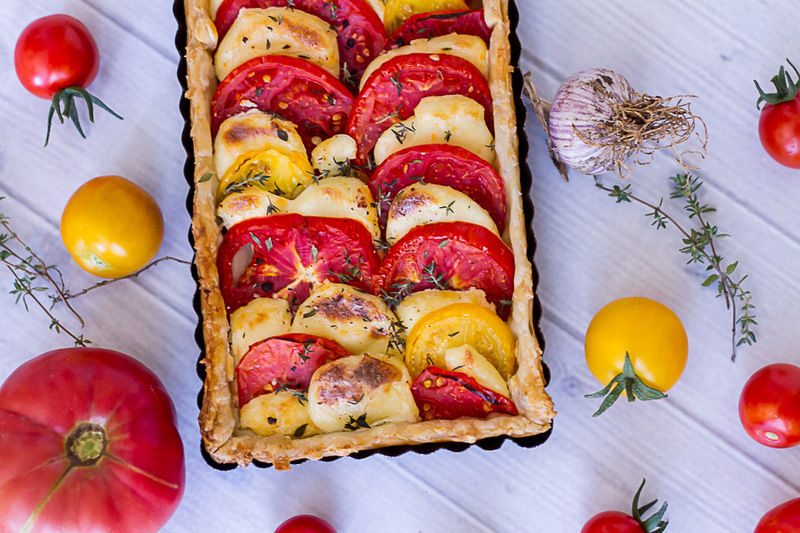 Line a tart tin with the puff pastry. Slice the mozzarella into the same thickness. Spread the finely chopped garlic over the base of the tart. 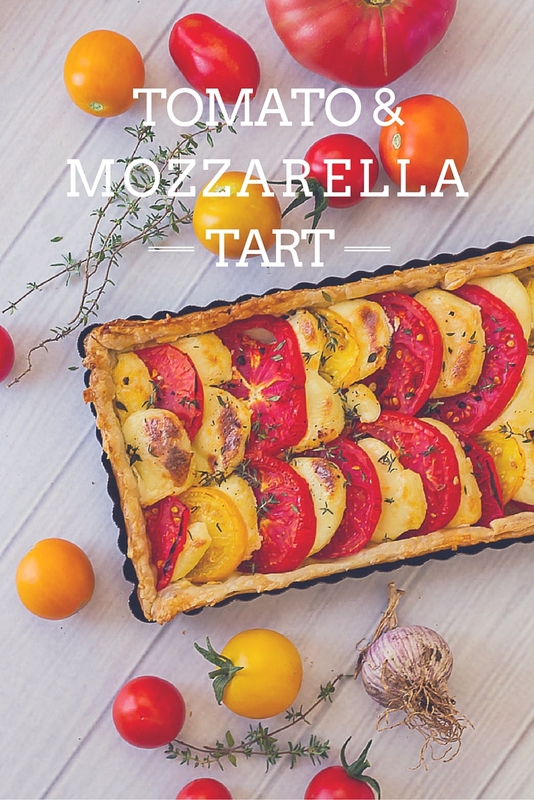 Layer the tomato and mozzarella alternately over the garlic to form one layer. Bake in a 200*c oven for 20 minutes or until the pastry is puffed and crispy. Drizzle with a little caramelised balsamic vinegar just before serving. Got any good ways to use up lots of tomatoes? Gazpacho cold soup . Cooked down and frozen for sauces for pasta. Cook with lentils or similar as a curry. Tomato (with vegemite) on toast was a summer breakfast treat and a welcome change from oats every day. Grilled tomato on BBQ.